for a very happy Valentines Day!! of the Kids (as he calls them!). and smelling my Valentine roses!!! I love you all, my blogging friends. I'm always thrilled to get comments and to read your blogs. and now I feel that I have such friends all over our country and in other parts of the world! February has always seemed like kind of a dark month to me, and this winter has certainly had its challenges! Here in New England, we're buried in snow, have leaky roofs from ice dams and are now going through some truly freezing weather! with color and comforting things! I received this wonderful hand cut valentine from my clever friend Elaine! She tells me that, at one time, some men's neckties had designs like this. I can't imagine what would be written on a necktie these days! 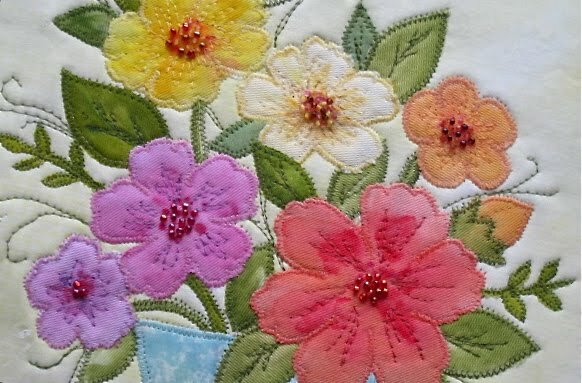 and the wool applique combined with quilting here. It's a bit late to start projects for Valentine's Day, but I think this book will provide me with plenty of gift ideas to use throughout the year. I'm still recovering from the surgery I had at the beginning of February. Apparently it was a difficult surgery - the gland was quite inflamed - and the area is still swollen. Today I put on makeup, felt great and went out for brunch with a friend. An hour later I was in pain again. So, this is definitely a time for patience. I'm trying to live in the moment, enjoy being indoor with the kitties, and work on a few low-key projects. I hope to share some of my landscapes soon. Spreading out fabrics, embroidery threads, beads and fibers is always uplifting to me! 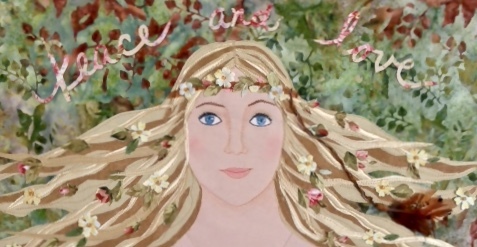 I hope that everyone who reads this has a wonderful weekend! With Valentine's Day approaching, I took out some of my favorite papers and fabrics, preparing to make some special cards. As I grow older, I find myself attracted more and more to the color pink or soft rose. In my stash there are plenty of examples of this color, in various prints and patterns, so I don't have to buy a thing! This is always an enjoyable part of February for me. 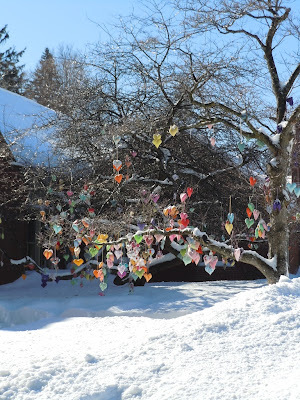 And in the spirit of Valentine's Day, my friend Andrea sent me some wonderful photos of a tree in a neighboring town which is decorated every year with handmade hearts. 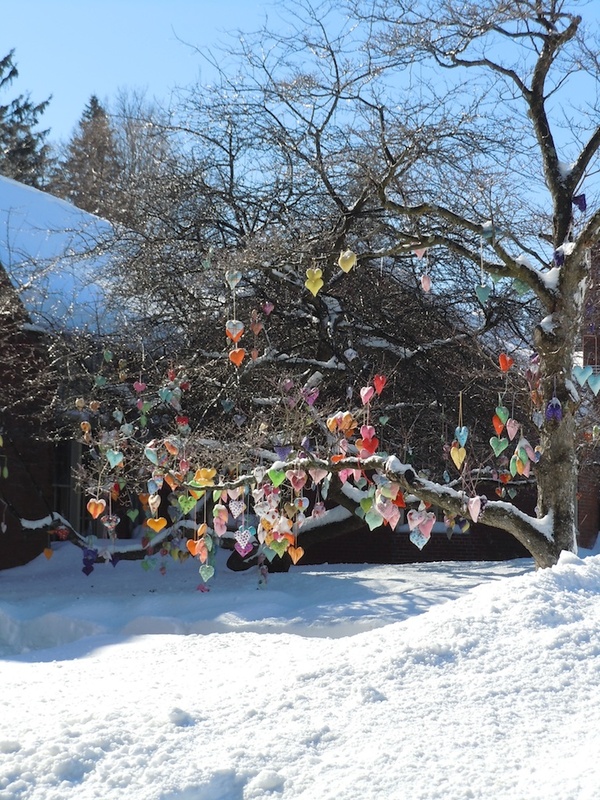 The tree stands in front of a church and gladdens the hearts of all who see it! 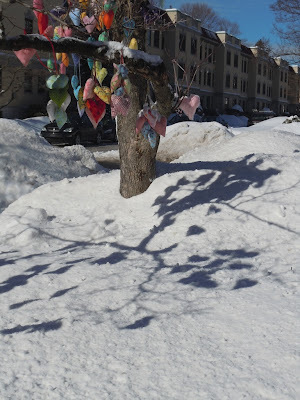 A great idea for any tree - I've thought of trying it myself! And I just have to add these funny photos of the kitties. Today, as I came into the living room, I caught sight of this display. and stayed like this for about twenty minutes! !